Primary Therapist, Casey Sims works with young adult students at our Ashland campus. Here is her reflection highlighting the caseload trip to Mammoth Lakes, California. As many of you know, Dragonfly Transitions is situated in an area with endless access to the great outdoors. Due to the extreme wildfires that occurred throughout the west coast this summer, it’s been particularly challenging to get outside and take advantage of these opportunities. The original plan was for our group to explore Glacier National Park in Montana. A few weeks before the caseload trips were scheduled to leave, Glacier National Park was added to the list of places impacted by severe wildfires. This was our first opportunity to practice flexible thinking and distress tolerance! Trip leader and mentor extraordinaire, Ria, gracefully rerouted our trip to Mammoth Lakes, CA. This year we traveled with 14 students, 2 mentors (Annie and Ria), 2 therapists (Chelsea and Casey) and of course Scout, Chelsea’s therapy dog. With the last minute re-route from Montana to California, we were able to cut our drive time in half, saving money, time, and energy. The first day of our trip we drove through Oregon, Nevada, and into California to arrive at our campground in Mammoth Lakes. We were given a serious warning by the camp host on proper food storage so to not attract bears. Additionally, the staff team reviewed proper safety protocol should a bear enter camp. That first evening we ate pizza, set up our tents, and fell asleep quickly underneath the trees and stars. We enjoyed a lazy morning, complete with French toast and fruit for breakfast (can you say glamping! ), group bonding activities, and an intention setting group. The students divided into creatively named chore groups – S’mores on Fire, Pizza Cats, and Pine Bears! These groups were responsible for cooking, cleaning, and keeping camp organized throughout the week. We then spent the afternoon exploring the nearby sites including a short Rainbow Falls hike and then took a refreshing swim at Sotcher Lake. The kitchen crew whipped up some delicious campground burritos for dinner before everyone climbed into their sleeping bags for the evening. 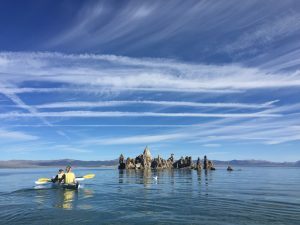 Mono Lake lies in a lifeless, treeless, hideous desert, eight thousand feet above the level of the sea, and is guarded by mountains two thousand feet higher, whose summits are always clothed in clouds. This solemn, silent, sail-less sea—this lonely tenant of the loneliest spot on earth—is little graced with the picturesque. It is an unpretending expanse of grayish water, about a hundred miles in circumference, with two islands in its center, mere upheavals of rent and scorched and blistered lava, snowed over with gray banks and drifts of pumice stone and ashes, the winding sheet of the dead volcano, whose vast crater the lake has seized upon and occupied. By the afternoon everyone was exhausted and covered in a layer of white salt. Throughout the whole trip, our group worked efficiently as a team, which isn’t easy when traveling with 18 people, and everyone rallied to pose for our first and only group picture of the trip. We spent the rest of the afternoon taking a quick coffee break in the city of Mammoth Lakes followed by an afternoon lounging at June Lake and swimming in the crystal-clear water. Day four was one of the highlights of the trip where we ventured all the way into Yosemite National Park. We split into three groups: the first group did art in the park, yoga, and dinner preparation with Chelsea and Ria on the valley floor. The second group was led by Annie on a 2.2 mile hike up Sentinel Dome, followed by a visit to the Ansel Adams museum. 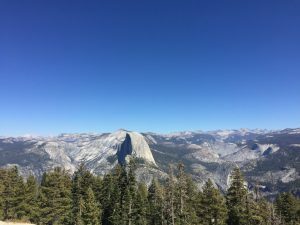 The third group tackled a 7-mile hike with 2,700 feet of elevation gain along the Upper Yosemite Falls trail, which was worth the view even though the falls had run dry. Once arriving back to camp and settling into bed, we were visited by some curious bears. The staff team was on top of the noises and quickly scared off the bears through their synchronized yelling and bear-spray ready stances. Nothing more than some curious bears looking for some tasty s’mores! 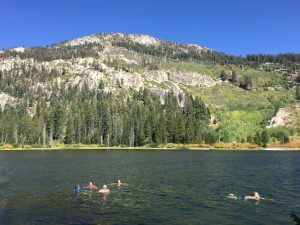 The remaining two days in Mammoth Lakes were spent horseback riding, biking, an evening soak in natural hot springs, and an early morning visit to hot creek geological site, which is reminiscent of the sulfuric pools in Yellowstone National Park. Delicious lunches and dinners were made, as well as a mid-week feedback group which allowed everyone to provide one piece of feedback and receive one piece of feedback from the group. Evenings were spent playing mafia, eating s’mores, and painting Scout’s nails purple. Days 6-10 of our trip took us 3 hours back north to Lake Tahoe. Another highlight of the trip was our 5-hour rafting trip, during which we split into two groups and paddled our way down the American River under the steady guidance of our raft guides. Swimming, rock jumping, and rafting wars took place. Everyone was drenched and chilly by the end of the trip, but we warmed up quickly in the comfort of our cabin. The final day of our trip was spent packing our belongings, cleaning the cabin, and participating in a final group – recapping the trip, sharing memories and takeaways. Themes that arose from our conversation included – surprised that camping wasn’t so terrible, the formation of new friendships, and a desire for the trip to last longer! Gratitude was also shared for the patience, engagement, and flexibility that every student, staff, and dog brought on this trip to make it smooth, successful, and memorable.